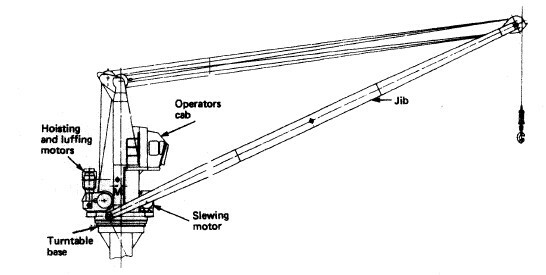 Defining Lifting equipments :Lifting equipment on board is required to be of adequate strength and stability for each load, having regard in particular to the stress induced at its mounting or fixing points , securely anchored, adequately ballasted or counterbalanced and supported by outriggers as necessary to ensure its stability when lifting. Lifting equipment should be of steel or other acceptable material and securely fastened to the vessel's structure. The maximum Safe Working Load (SWL) and maximum radius of operation of all derricks and lifting appliances are required to be part of the specification on all new constructions with associated ropes, wires and guys, eye-plates, shackles and blocks designed to meet these loads. The vessel's structure, crane, derrick or other lifting device and the supporting structure should be of sufficient strength to withstand the loads that will be imposed when operating at its maximum load moment. In addition to the strength and stability of the lifting equipment, consideration should also be given to the stability, angle of heel and potential down-flooding of any vessel as a result of the use of a crane, derrick or other lifting device fitted on it. This is especially important where a crane is to be fitted on a work boat or other small vessel and it is recommended that advice should be sought from the crane manufacturer in such cases prior to the crane being fitted. Similarly it is recommended that a check of the vessel's stability should be carried out by a suitably qualified person, prior to installation of a crane to ensure that the vessel is capable of operating safely with the crane fitted and in use. Failure to do this could have serious consequences for the safety of the vessel and the workers on it. Any welding of material should be to an approved, acceptable standard as any fitting is only as strong as the weld that connects it to the vessel's structure. If counterbalance weights are moveable, effective precautions should be taken to ensure that the lifting appliance is not used for lifting in an unstable condition. In particular all weights should be correctly installed and positioned. Lifting equipment with pneumatic tyres should not be used unless the tyres are in a safe condition and inflated to the correct pressures. Means to check this should be provided. The operator should check safety devices fitted to lifting appliances before work starts and at regular intervals thereafter to ensure that they are working properly. Accessories for Lifting etc. Every part of a load that is used in lifting it, as well as anything attached to the load and used for that purpose should be of good construction, of adequate strength for the purpose for which it is to be used and free from defects. (v) the mode and configuration of slinging. Accessories for lifting should be stored in conditions which will not result in damage or degradation. There is a legal requirement for lifting plant to be tested every five years. This article provides advice to the competent person carrying out the test. (d) in the case of a lift truck, the test should be a functional test to verify that the truck is able to perform the task for which it was designed. This test should include a check to ensure that all controls function correctly and that all identification and capacity plates are fitted and contain correct information. A dynamic test should include travelling and manoeuvring, stacking, a lowering speed check and tilt leakage test with the rated load including relevant attachments where appropriate. Following the test the truck should be examined to ensure that it has no defects which would render it unsuitable for use. Any defect found in any lifting plant, including plant provided by a shore authority, should be reported immediately to the master or to another responsible person who should take appropriate action. Similar principles apply to cargo securing devices as to lifting equipment. The crew and persons employed for the securing of cargoes should be instructed in the correct application and use of the cargo securing gear on board the ship. For guidance on the securing of cargoes and handling of security devices refer to the ship's approved Cargo Securing Manual.